The IHCA Rules Committee would like to ask for comments on a proposed rules change. An issue about the length of the Hobie Cat Dragoon spinnaker pole bridle wires has been raised with Rules Committee for clarification. Addressing this matter, we have prepared below proposal. It has been endorsed by World Sailing and is hereby distributed for comments according to the provisions of General Class Rule 24 and the policy of IHCA. Changes to the current rules are in red italic. 11.2 Only bowsprits supplied by a HOBIE CAT COMPANY are class legal. The bowsprit shall have a blunt end cap fitted. The bowsprit shall be fixed on the longitudinal centre line of the boat as provided by the manufacturer. The length of the bowsprit bridle wires shall not be shorter than 1000 mm, and they shall be attached to the bridle tangs. Supporting wires/lines may be shortened, lengthened, mounted and/or rigged in any manner. Additional blocks/cleats for spinnaker running gear and jib luff control as well as snuffer type systems may be mounted on the bowsprit. Comments to be sent to rules@hobieclass.com with copy to david.brookes@hobieclass.com. 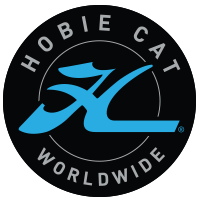 Please state your full name and the Hobie Association/Fleet you are a paid up member of when making your comment. Deadline: February 28, 2017. The proposed change is supposed to go into effect as of April 1, 2017, under provision of IHCA Council approval.